Why Didn’t These Catch On? 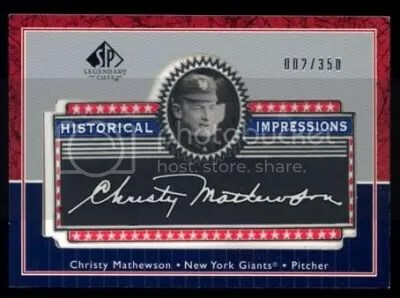 Historical Impressions were inserts that could be pulled from boxes of 2003 Upper Deck SP Legendary Cuts. With a hobby filled with manufactured letter patches, I’m really surprised this concept didn’t stick around. As you can see these cards feature a rubber stamp containing a facsimile cut signature. I don’t know about you, but I’d rather pull one of these from a pack instead of a letter patch of some no name rookie. Back in 2003 I pulled one of Mickey Cochrane, but it has since moved to a new home. I’ve always thought these looked cool and are great for those people that can’t afford a real cut signature for their collection. Most of them are serial numbered to 350 copies, but you can find parallels limited to fewer numbers. I say bring these back and ad in a few relics to them.